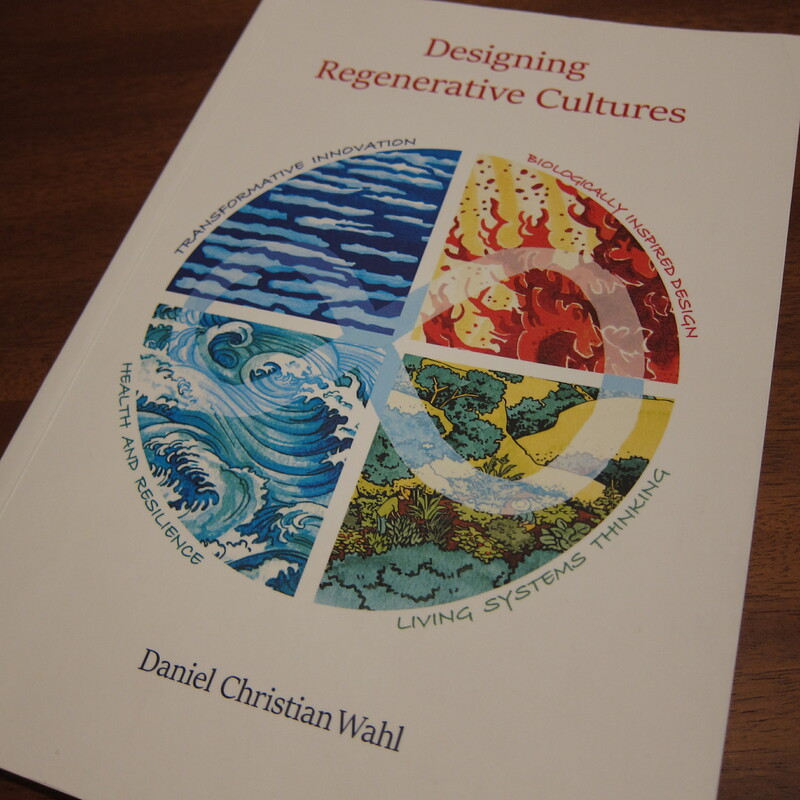 Given the emotional fall out of the American elections this week and the global turmoil we are currently facing, it seemed apt to be able to offer some grounds for optimism in this review of the new book Designing Regenerative Cultures by Daniel Christian Wahl. Daniel is German and originally trained as a biologist and zoologist at the University of Edinburgh. In 2002 he completed his MSc in Holistic Science at Schumacher College which he then followed with a PhD in Natural Design at the University of Dundee, writing a thesis entitled Design for Human and Planetary Health – A Holistic/Integral Approach to Complexity and Sustainability. As he recounts in his book, Daniel’s PhD research took the view that “all design should aim to increase diversity and resilience as a means to increasing whole-systems health” and in the following years he has been putting this philosophy into practice, spending four years living at the internationally acclaimed Findhorn Foundation ecovillage in Northern Scotland, and working as a consultant and educator with organizations like Gaia Education, Bioneers, the Clear Village Foundation. he is also a member of the International Futures Forum and a fellow of the “Royal Society for the encouragement of the Arts, Manufacturers, and Commerce’ (RSA). Daniel now has a permanent based on the island of Majorca, where “I have chosen a place to make a stand and do what I can to contribute to the positive emergence in a well-defined bioregion”. The seed for his book however was planted as far back as 2006, when he interviewed Professor David Orr about “his vision of ecological design as an integrative discipline that could enable the transition to sustainability”. Interestingly Daniel starts the conversation and narrative by asking “why we are worth sustaining”, a profound question designed to shape “how we might initiate wise actions that help us to transition towards regenerative cultures”. Daniel starts his book with a look at why we need to change our collective narrative. While the majority of readers of this book are likely to already be in general agreement with a need for transition, this is still an important section in relation to laying out the approach Daniel will take. His emphasis is on the rediscover of deep wisdom, the path to wisdom being deep questioning. This practice is grounded in complexity science, which teaches us to embrace uncertainty and ambiguity in complex dynamic systems and which invites us to “shift our attitude and goal to our appropriate participation in these systems, as subjective,co-creation agents”. This approach to deep questioning allows us to see transition not only as a purely technical problem and to take a systemic approach to sustainability, one which aims to “sustain the pattern that connects and strengthens the whole system”. 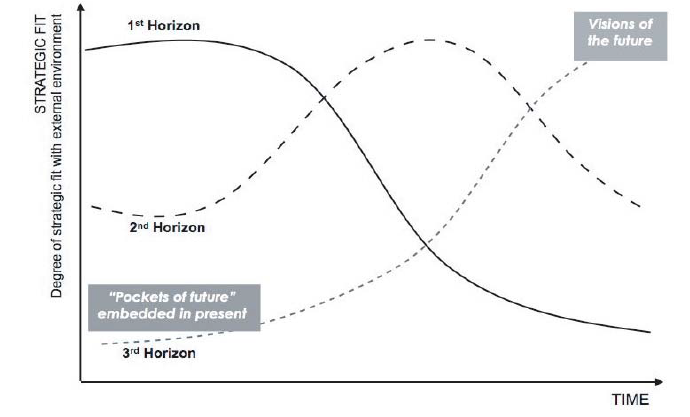 In the next chapter Daniel explores the question of the technical approach to sustainability more deeply, and I like the way he has chosen to frame this discussion using “The Three Horizons” framework developed by a number of members of the International Futures Forum and other futures practitioners. This framework builds on the distinction Clayton Christensen made between ‘sustaining innovation’ (that which maintains the status quo, as opposed to being sustainable) and ‘disruptive innovation’ (which render existing technologies and business models obsolete). The longer term third type of innovation is ‘transformative innovation’ which “facilitates the transition to regenerative cultures”. As Daniel points out, “the three horizons perspective and practice is an invitation to move from rigidly held and defended ‘mindsets’ to being able to develop future consciousness by valuing the perspectives of all three horizons”. As I think most of you will know, I am working with Fritjof Capra on his on-line course Capra Course, which is based on his latest book The Systems View of Life: A Unifying Vision. Fritjof’s work and thinking has been of great influence to Daniel, who articulates clearly both the message of the need for systems thinking, but also more importantly how we can start to apply systems thinking in the context of transformational design. More than a set of tools, systems thinking is an art form of creatively dancing with complexity that has the power to transform us and our world. It can make us see ourselves, and our world, with different eyes. Culture change is first and foremost about a collective shift in perspective and consciousness, leading to a shift in values, intentions and behaviour. The technologies we employ and the designs we implement both support these changes and manifest our intentions materially and in the systems and structures we set up. Yet these relationships are circular, not linear. Our awareness and perspectives influence our behaviour, the technologies we employ and the way we ‘design’ solutions; while past designs and past solutions continue to shape our worldview and awareness. This chapter explores many aspects of design including beauty, values and the way in which conversation is central to design. Maria and I certainly enjoyed the wide-ranging conversations we have with both our students who attend our courses in innovation, design, strategy and change management, and also with our clients who are fully-engaged with the issue of transformation. Throughout the book Daniel takes a conversational approach, and provides many probing questions which can inspire many different forms of facilitation and systemic co-creation. I deeply believe that if we really want to create regenerative cultures of fairness and inclusion based on nurturing relationships with the community of life, one of things we have to do is to listen more deeply. We are relational beings who come from cooperation, are cooperation, and can choose to co-create a thriving and regenerative future through cooperation. As beings who are blessed with the miraculous gift of a self-reflective consciousness, our greatest challenge and our greatest opportunity is not to know the meaning of life, but to live a life of meaning. That is why humanity is worth sustaining. Designing Regenerative Cultures provides a clearly-written and well-articulated set of guiding principles for organisations and individuals seeking to shift their thinking into a systemic and regenerative mode of design consciousness. Building his narrative on the well-establish foundations of systems thinking and complexity theory, Daniel also provides extensive case studies and examples of transformative design which can inspire us to change our pathways to lifestyles and business strategies which vitalise our ecosystems, both natural and economic. I can certainly recommend his book for the participants of Capra Course, those who are interested in how we can actually put systems thinking and a deeper approach to sustainability into practice, and indeed to the many students around the world who wish to contribute to the transformation of design, and who indeed are already starting this movement. Designing Regenerative Cultures, 3rd May 2016, is published by Triarchy Press.